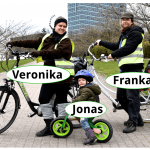 .To the Green Lakes of Verkiai . .and the “ Centre of Europe ” sculpture park . which will lead you to the . Monastery of Trinapolis There you have to follow 1 ½ km the road until you come to the . famous Water Mill of Verkiai If you take the road right before the mill, it will take you safely and traffic free up to Verkiai manor house where you should enjoy the view point and be estonished how many forests you may find within the city. Turning the manor house the back and passing the former horse stables will bring you to the road. On the other side a bicycle path is starting. Soon, it gets away from the road and lead you directly to the lake. a museum in the nature of 55 ha size which goal is “to give an artistic significance to the geographic centre (as determined by the French National Geographic Institute in 1989) of the European continent and to present the best of Lithuanian and international modern art achievements.” The bad news is that probably you will have to cycle all the way back. 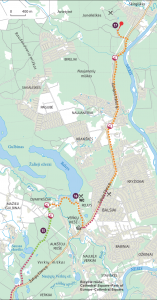 We recommend an a bit alternative way via the former Verkiai paper mill Sportive cyclists may cycle ahead to the town of Nemenčine and take the bicycle path (it is not in the best condition) from there back to Vilnius city .